We are a leading manufacturer, exporters of Various Industrial Minerals like Silica/Acidic Ramming Mass, Silica Sand, Hematite Powder, Garnet Sand, Barytes Powder etc. to our customers. 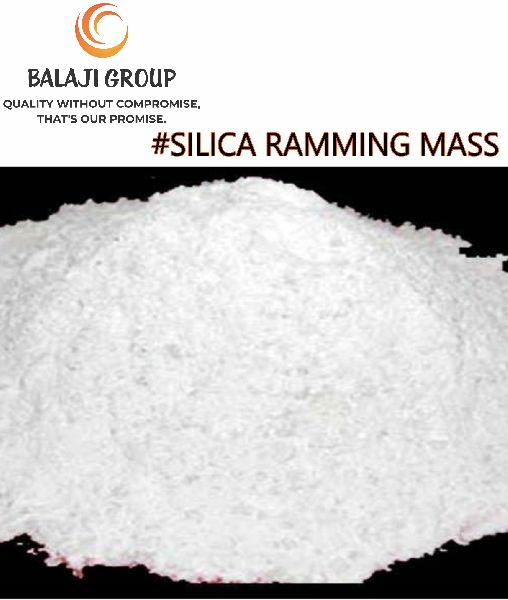 The offered mass is processed using high quality chemical compounds and progressive technology in line with industry quality standards. Owing to its varied features, this mass is widely demanded in different industries. Moreover, customers can avail this mass from us at market leading prices. Features: Price range : USD 77 (Non-Premix) to USD 150 PMT (Premix with 1.2% Boric Acid) FOB (Mundra Port, India). Wear resistant Optimal bulk density Free from sintering agent Packing: 50 Kg HDPE Bags. Big Jumbo Bags of 1.00MT. Savings: By using our super snow white -- pre-mix grade material, clients can enjoy numerous benefits in the form of savings. Save upto Rs.50.00 Lac by getting 25-50% extra lining life 12% more finished steel production with the same production capacity Save steel farma cost used in each lining Reduced down time Save 15% on electricity bill, labor cost etc. Used In: Metallurgy Furnaces Additional Information: Item Code: BALAJI Pay Mode Terms: TT / L/C (Letter of Credit) Minimum Order Quantity: 28 Metric Ton(s) Port of Dispatch: MUNDRA, INDIA Production Capacity: 10000 MT PER MONTH Delivery Time: Within 3-4 days from the receipt of your confirm PO. Packaging Details: 50Kg. HDPE Bags & 1MT Jumbo Bags. Packaging Details 50 KG. HDPE BAGS / 1MT JUMBO BAGS.